While we’re speaking of French wine, specifically Bordeaux, I thought it would be good to place it geographically and address some basics. While this may seem elementary to many, others may appreciate a refresher? 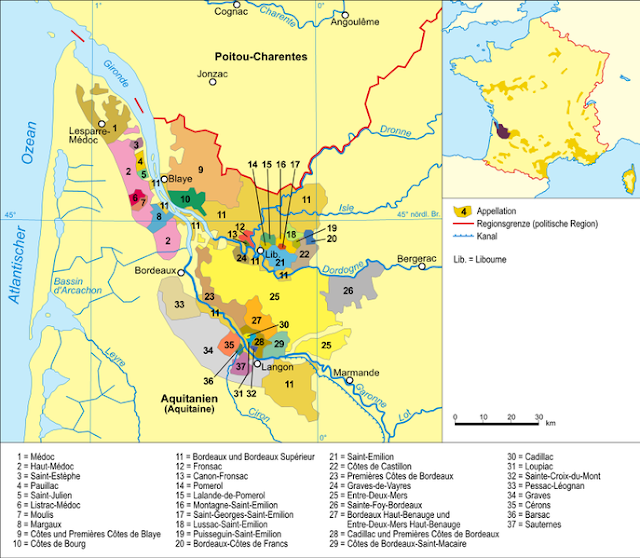 Bordeaux is located in the Southwest region of France, lying along the path of three important rivers. The mighty Gironde is fed by the Dordogne & Garonne as they all make their way to the Atlantic Ocean. The name Bordeaux is actually derived from aubord de l’eau or “along the waters”. How lovely is that? By law, red Bordeaux wine must be made from one or more of five red grapes: Merlot, Cabernet Sauvignon, Petit Verdot, Malbec and Cabernet Franc. Merlot and Cabernet Sauvignon are the 2 most important. Petit Verdot, Malbec and Cabernet Franc are used occasionally and in lesser quantities for blending purposes. Merlot provides a fleshy, round quality along with a certain elegant expression when used masterfully by winemakers such as Jean-Luc Thunevin (see previous blogs). Indeed, I believe Merlot has been perceived badly as a result of some poor use of the grape. Mon Dieu! Cabernet Sauvignon lends texture and structure from tannins, which act as a preservative and also provide great aging potential. Petit Verdot adds depth of color to the wine, along with spicy/peppery characteristics and tannins. Malbec is added for dark, rich color and flavor (In Cahors it is used as a primary grape), while Cabernet Franc is aromatic and herbaceous, suggesting perhaps hints of violets! When we’re speaking of Bordeaux (or possibly any great or quaffable wines) we are talking about “terroir”. That is, wine deriving its characteristics from the land from which it comes and also the climate from a particular year (vintage). These areas aubord de l’eau, are organized by Left Bank and Right Bank. Some names/towns/regions/subregions you may recognize. From the Left Bank, Medoc and Haut-Medoc, Graves, Pauillac, St.-Estephe, St.-Julien, Listrac and Margaux. From the Right Bank, Cotes de Blaye, Cotes de Bourg, Fronsac, Pomeral, and St. Emilion. As time goes on, we will explore some of these. Suffice it to say this is a huge simplification of a complex wine area in France ... but hopefully enough to wet your whistle for being adventurous in knowing and experiencing wines! p.s. Also visit my friend Ned's blog (Devenish Wines) for amazing wines & descriptions!